Didn't read the manual for that new toy, didja? Lucky for you, we've compiled QAGS STUFF, a new equipment guide full of toys and exapmles of how to use them. Whether you're playing in a fantasy, horror, modern-day, or science fiction game, QAGS Stuff has everything you need. It's chock-fulla the damnedest things, from pointy sticks and armour to time machines and the mighty Cathedralpult. 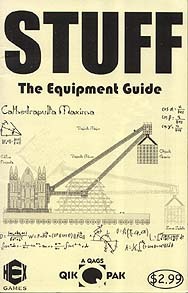 Stuff is fun to read and the equipment inside can be easily adapted to any game system.